Ignorance | Milan Kundera- This little novel is a very literal exploration of nostalgia. Like, too literal. I really love books that center on nostalgia, but this was basically the philosophy of nostalgia with a thin storyline to explore it. The book uses the irony of Homer’s homecoming as a basis to examine the expat experience, and to look at memory and forgetting, but it only serves as a framework for thee author to expound on his own ideas about the subjects. If you’re looking for something tender or atmospheric, this isn’t it, though if you enjoy a more straightforward take, it might be for you. Also, fair warning, everyone is miserable in this novel. The Sense of an Ending | Julian Barnes- From the literal first page I knew I had a winner. This actually ended up giving me everything I had wanted from Ignorance and didn’t get, and it was glorious. Barnes explores memory and nostalgia in such an elegant, layered way with plenty of feels and room to reflect on one’s own life. Plus, it had a great plot twist at the end, and just enough messiness in it’s tight structure to leave some space to make the book highly worth discussion. I loved it. A strong 4.5 stars, and one of those books that will stick with me very intimately in the very best way. The Dream Thieves | Maggie Steifvater- I continue to love this series on audio. I love the narrator, I love the characters, I love the plot line thats just enough magical to satisfy my YA fantasy loving self. This book centers more on Ronan who is such a fascinating and well built character, and I just really appreciate how Stiefvater handles him. This series is the perfect brain break and fun read when I can’t pick up a physical book. I’ve already started the next one, and will really miss these characters when I finish! Blue Lily, Lily Blue | Maggie Stiefvater- The third book in The Raven Cycle, and still loving it! On to the final installment! Hey Kiddo | Jarrett Krosoczka- I love a good graphic memoir, and this one did not disappoint. I loved the art style and the honest look at a complicated family. Just a solid story, beautifully told. I feel like saying too much about it will ruin it, but if you also enjoy a good graphic memoir, this one is absolutely worthwhile. The Hours | Michael Cunningham- After reading and LOVING Mrs. Dalloway this past December, I knew I needed this book in my life. Annnndddd it turned out to be that magical 5 star read we all hope for every time we crack open a new book. I loved how Cunningham took Mrs. Dalloway and made it something wholly his own, while pulling out some of the most important elements and bringing them into the modern world. He also really nailed the stream of consciousness style and that magical ability to focus on the micro to showcase the macro; zooming in on those little details that end up saying something profound. I can absolutely see why this won the Pulitzer, and it’s one of those books that will not only stick with me, but one that makes me grateful to have read it. I will say that if you haven’t read Mrs. Dalloway, this might be a little less impactful without that context. Dark Lord of Derkholm | Diana Wynne Jones- A nostalgic childhood favorite, this was the read aloud my brother and I chose for our road trip this last week, and it was perfect. Funny, easy to read aloud and to follow, but with a fun, layered plot and a good message. Highly recommend this one if you enjoy middle grade/YA, because Diana Wynne Jones is truly magical. At Dusk | Hwang Sok-yong- This was dense in the best way, and much like Elena Ferrante, deceptively straightforward. I picked it up because it was on the international Man Booker Prize long list and I really enjoy books in translation, and am so glad I did. This author is apparently beloved in Korea, and he does a wonderful job with alternating storylines between two characters and working with themes of nostalgia, the effects our choices have on others, and what it means to be successful. These characters are so alive, and their stories so developed despite being under 200 pages. Well worth the read, and I hope to see this on the short list! So You’ve Been Publicly Shamed | Jon Ronson- This was so well done! A great look at how public shaming operates in the age of social media. Ronson manages to be sharply funny and compassionate at the same time, and this is narrative enough to suit the style of non fiction I enjoy. Plus, it’s just morbidly fascinating, honestly. This is our IRL book club pick for April and I can’t wait to discuss it with the group. Turbulence | David Szalay- This was short and underwhelming for me. I read about 3/4 of it and just DNF’d it because it wasn’t doing anything for me. The concept was great, but the execution was painfully mediocre, which was so disappointing. This comes out in July, and a big thank you to Scribner for gifting us an early copy! Bread & Wine | Shauna Niequist - I was hoping this would be like Ruth Reichl’s My Kitchen Year, which I loved. And while this book was set up the same way, it wasn’t quite as enveloping. Where Reichl brings in stories of family, travels, and nostalgia to lead up to recipes and beautiful images, Niequist put in a few too many intimately personal stories with a heavy through line of miscarriage, which I was not expecting. I did like the personal touches with her stories of entertaining and friendships, and it would’ve been excellent had she left it there. Valley of the Dolls | Jacqueline Susann - I’ve been wanting to read this book for so many years, and I finally came across a copy at the library and snatched it up. It was such a fun, interesting book that had an all too real, sometimes heartbreaking truth to women’s lives in the 60s. The pressures women faced back then are still relevant to the pressures of women today, making this novel worth reading for all time. How to Find Love in a Bookshop | Veronica Henry - I needed to keep going with lighter, fun novels, and this one certainly fit the bill. Found in a Little Free Library, I dove right in and didn’t put it down until I finished it. While it was filled with cliches and stereotypical tropes, it left something to be desired. However, it was truly a charming story with a happy ending you’re expecting and happy to get to. H is for Hawk | Helen Macdonald - First thing’s first, I didn’t go into this book with the awareness that it was a memoir. Once I did realize it, however, it made all the difference. I was so impressed with the subtle layering of nuance mixed with grief and emotion. With all of that, it wasn’t an emotional read by any means, but I was aware of how emotional it likely was for her. Dare to Disappoint | Ozge Samanci - My son and I picked a few graphic novels to read together this month. I was really into this one, especially as I noted the concept similarities with The Best We Could Do, on a much smaller scale. I love the memoir aspect and how a bigger picture is shrunk down to fill small illustrated squares, often done by the writer, and keeps you turning page after page. It’s a fun, quick break from typical reading. Cry of the Kalahari | Delia and Mark Owens - If you’re familiar with Where the Crawdads Sing, you’ll likely be familiar with Delia Owens. After reading Crawdads, I picked up one of Delia’s non-fiction books about her time researching and protecting the wildlife in Africa. She’s a truly fascinating person and I loved this book that details what their living situation was like in the middle of nowhere African desert. I can’t believe how slowly I read this book though, I soaked in every single word on each page, fascinated with the details of wild animals (read: lions) they got to know, how they comforted one another, how they dealt with the intense weather, lack of commodities, and even their marriage. Eye of the Elephant and Secrets of the Savanna are up next on my list! 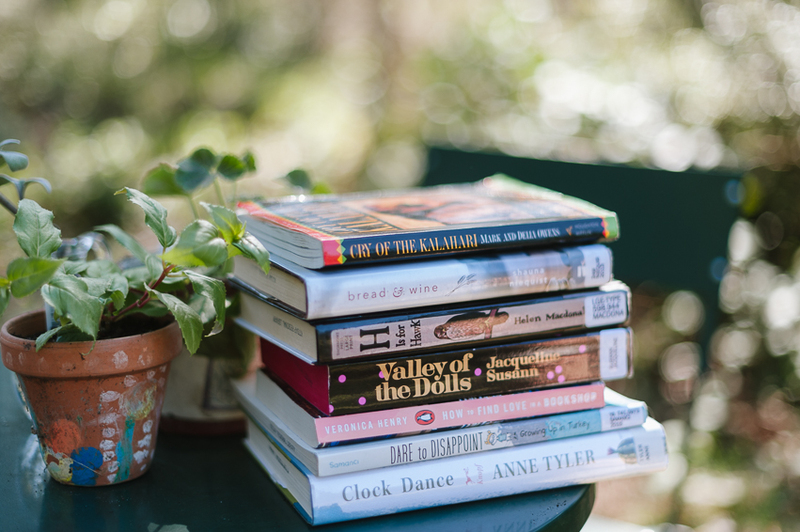 Clock Dance | Anne Tyler - This book came in on hold for me at the library, although I have no memory of ever even coming across this book before. I decided to give it a try. I kind of knew early on this might be too contemporary of a novel for me, but I persisted. Tyler does a good job at creating detailed scenes and setting the stage for what’s happening. But, I just didn’t get a lot of the book. There are three main parts of Willa’s life (actually broken into Part 1 and 2), which abruptly end and fast forward decades at a time. I was reminded of my lack of patience for overly passive characters, especially if they aren’t truly developed, which was likely the hardest part of sticking through this story. Did you read anything you loved this month?